I’ve been sick as a slicehound all day today. Of course I have, it’s that MMO gaming rule again: I made time to play last night and the server crashed. Made time to play this morning and spent it wanting to pray to the porcelain god instead. All the fun of being drunk without the drinking part. Ho hum. 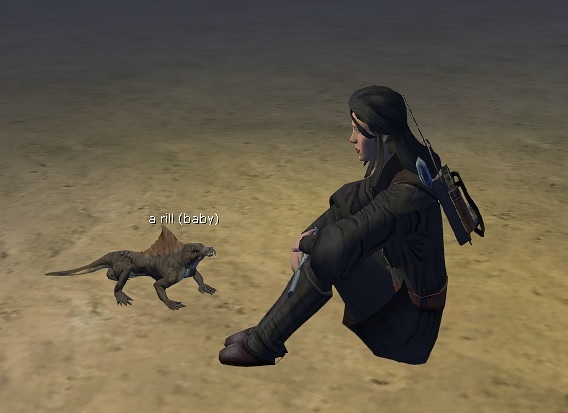 Nonetheless, Ysharros the Mundungo-Creature-Whisperer-to-be got lucky in the couple of hours I did manage. As soon as I got in I headed to Mos Espa on Tatooine — I have no idea why, it’s just where I felt I should go to look for critter-babies. 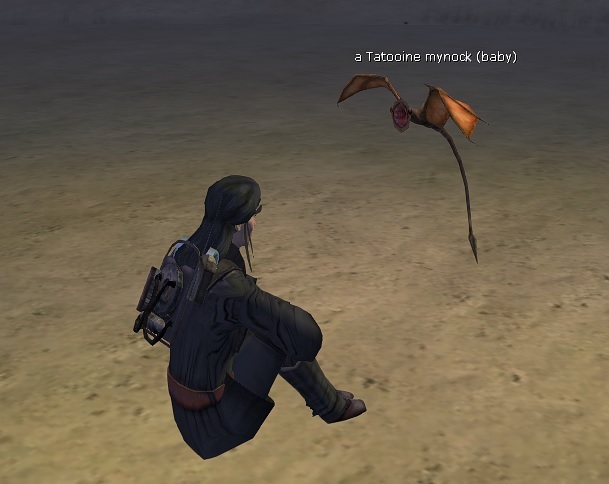 And indeed as soon as I step out of town the first creature I see is a baby mynock. TAMED! A little further on I spot a Rill baby… TAMED!! Actually, that one was harder. It was more wary of me, possibly because I killed its parents before I noticed it was in the group. Ahem. /mask_scent to the rescue! But then I spotted a bio-engineered non-CH pet store… And then I spent ALL MY HARD-EARNED MONEY on a bio-engineered bluurg. Because I used to have one and this guy looked just like him. TAMED!!! 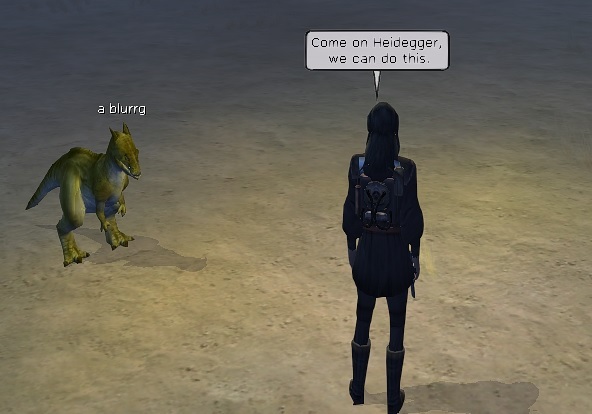 He lost most of his stats, of course, but I’d never have been able to tame a bluurg at this stage even if I could remember what planet they come from. I’m thinking of going with philosopher names for my pets this time. One needs a theme, and given how I felt today it seemed appropriate — I intend of course to be guided by The Philosopher Song for my selections. I can’t actually name them in-game yet (need a fourth command and eleventy-zillion CH XP), but we’ll get there. 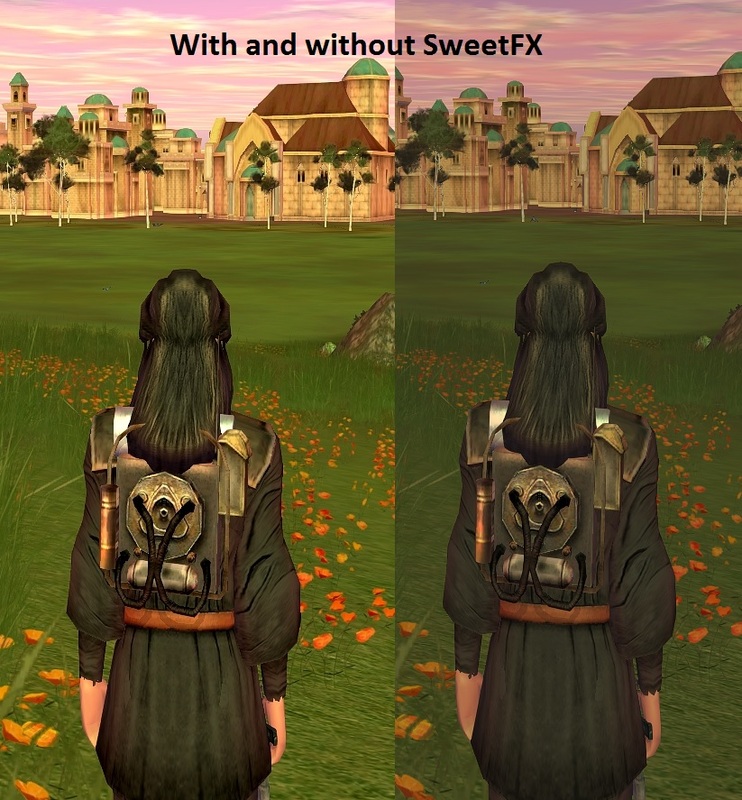 Last but not least a comparison of the client graphics with SweetFX and without. Looks better don’t it? The backpack and hair textures are pretty good. Now back to feeling sick and sorry for myself. I’m sorry for your misery. Hopefully it’s gone tomorrow and your pets are ready to learn new tricks. Bummer about being sick and THEN server crash down. I’ve had that happen before and it makes life even more miserable than it was before. In most cases, Irish whiskey, mixed with tea and honey at least makes you not care one way or another! Here is to hoping you feel better! Loving the nostalgia trip, Please keep posting screenshots and telling us your stories.